Going to Mass is a habit I treasure. But that habit was not always the case. what habits I have which I no longer want. Buffet is correct, habits are tough to break. I’m not sure why I made the connection, but while reading Buffet’s quote, the idea of going to Mass on Sunday popped into my head. Today, going to Mass is a habit. And it’s a habit I treasure, as I wrote about here. But for a long period of time, I had “quite the opposite” habit. Sunday mornings were for running out, buying bagels and the Sunday paper. Or, just sleeping late after a Saturday night. Then, sitting around doing nothing the rest of Sunday morning until football came on, or some other distraction. Once the lads got a little older, soccer games were scheduled – sometimes starting at 9:30 or 10am in the morning. Who could go to Sunday Mass then, right? I had my built-in excuse (thanks guys!). As the years went by, travel baseball and travel soccer filled up much of our Sundays. Pack up the car and off we went. 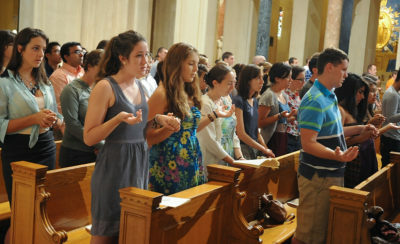 Why did we let the habit of going to Mass on Sunday slip away? And I write “we” because I know I’m not alone. It’s a national epidemic. There’s probably twenty potential blog posts alone needed just to begin exploring that topic. And yes, yes, we’re all aware we can attend other parishes with different schedules and there is a Mass on Saturday evenings (we have our built-in excuses for not attending then, too). So why are we not going to Mass? Not a single reply came back stating, “I don’t understand why we have to go each week.” Even among our regular contributors, we found (through check deposits) they do not attend each week, but are sporadic in their attendance too. So we know there are plenty of reasons/excuses why we are not going to Mass on Sunday (or Saturday evening). How did “not attending” or “not going to Mass” become a habit? The answers may not be as important as the realization of the current habit. Yes, examining the potential reasons why we are not going to Mass may be enlightening, but becoming aware of a habit (not going to Mass) may be more important. Dr. Thomas Lickona (@tomlickona) wrote a wonderful article about going to Mass, which I found over at Catholic Education, Eight Reasons to go to Mass. Incidentally, I discovered that Warren Buffet quote while reading one of my favorite blogs, Farnam Street. If you are interested whatsoever in learning about how your brain works, how our thoughts control our direction, check it out. And tell Shane (@farnamstreet) you learned about his site through us! What are your thoughts about this habit, and how do you feel we can start to change that habit (in ourselves, and in others around us)? Leave your thoughts in the comments, or reach out to me on Twitter at @catholicblogger. Catholic News Agency said the Pope also added, “Today’s feast tells us that if we want to go forward, we need to turn back: to begin anew from the crib, from the Mother who holds God in her arms,” he stated. We all wrestle with “New Years Resolutions.” And many of us struggle with changes we need to make in our lives. By focusing on Mary the Mother of God we can leave “the baggage” we carry with us in our daily lives, and move ahead. Consider all the changes Mary went through! Catholics mark January 1st each year to celebrate the Solemnity of the Blessed Virgin Mary. On some years (when the date falls on a Sunday), this is a holy day of obligation. Did religious spin artists exist back in Jesus’ time? My parish (St. Rose) handed out a gift recently on Ash Wednesday. “Not By Bread Alone 2017 – Daily Reflections for Lent” What a wonderful gift! These reflections were written by Genevieve Glen, OSB. Before we begin, did you know Genevieve Glen happens to be one of the great hymn writers of our time? She is a Benedictine nun at the Abbey of St. Walburga in Colorado. First, Matthew 23: 1-12 was the source for Glen’s reflection today (today’s Gospel). Glen wrote “Jesus challenges us to take a new look at “scribes and Pharisees.” Glen called them “religious spin artists then and now.” Additionally, she pointed out “…all their works are performed to be seen. Furthermore, I believe the principle behind the message from Jesus is still current today: For some folks (sadly), image IS everything. Do you know people who “wear” their faith? Customers at our lonely store ask us about wearing rosaries. Crucifixes as fashion statements? Or always wearing over-sized religious jewelry? Glen asks incisively: Do folks wear this stuff to convince others — or to convince themselves they are worthy of God’s love? Good question! Look, it doesn’t matter what you were (or what you wore?). It matters what you ARE, and what you aim to be, from this day forward. From the Twenty-fourth Sunday (Mark 8), we learn that Jesus is (in one moment), happy to hear Peter speak up and recognize Jesus is the Christ. But Jesus soon rebukes Peter. Because as Jesus explains what is to happen to him soon, Peter tries to rebuke Jesus — Peter simply does not want to hear it or believe it. We may not understand it. We may not like it. But God has a plan. Speaking of “thy will be done” I want to share a story with you. A woman in our parish, a Eucharistic Minister, distributed holy communion with me just three weeks ago at a local rehabilitation center. Then, last Sunday, I visited with her, as she was now a patient in the very same facility! This very healthy person was stricken with a rare illness, out of the blue. This woman dedicated her life to her parish, to her faith and her family. On Wednesday, she passed away. She was just 57 years old. Breastfeeding is considered to be one heroic act of mothers. More so, if you can continue breastfeeding your child until 2 years old. For many moms, this is an easily achievable feat but for others it can be heartbreaking. One mom shares her frustrations about not being able to breastfeed and the guilt that she has to go through at A Woman With Opinions. Many moms plan to give the best for their children and that includes breastfeeding. Breastfeeding has all the necessary nutrients that every newborn needs. But what happens if breastfeeding for you and your baby really does not work out. Some are filled with grief that after planning on breastfeeding, they end up using bottles. Now is the time to ease your worry. What works with another person may not work for you and your baby and this fact just needs to be accepted. What you can do? Find another alternative and move on. There are a couple of choices that you might want to try. There are surrogate breastfeeding volunteers who are ever willing to share their milk with your young or you can choose formula milk and bottle feed your baby. If you tried but nothing worked then go easy on yourself and plan on what will work best for you and your baby. Growing up, I had fears of my own. First, I feared the crowd then feared of boys and relationships. So how do these fears happen? Some of the fears that we have as adults began to develop when we were children. We carried these fears as we grew older and have failed to address them thus they haunt us until now. So, how do we prevent things like this from happening to our kids? A blog entitled Parenting the Fearful Child gives advice on how parents could help handle fears in their children. For children to become the best that they could be and avoid issues with fear and anxiety in the future, there are parenting styles that can help. It is also important to recognize the fear and know where it is coming from. All parenting styles should always have communication. An open line of communication between parents and children is important. A post from Pint-sized Treasures got me thinking. The blog post talks about honesty and how far does honesty go especially when concerning your child. As a parent it is your responsibility to hone your child’s skills as well as correct negative traits and values. One of the things that a lot of children normally gets away is are little lies. Most parents would not mind their children lying as long as they are not harmful or just little white lies. But lying can become habitual. If you let your child get away with those little white lies, is there a tendency for your child to become a chronic liar when they become an adult? “You better be good or I am going to call 1-800-North Pole and tell Santa you need to be put on the bad list! Take the medicine, it tastes like candy! The shot won’t hurt sweetie, just close your eyes and hold my hand. Tell Uncle Ben I’m not here. I don’t feel like talking. If you cross your eyes, they will get stuck. If you don’t come here now, i will leave you by yourself. Personally, I am guilty of these white lies. But I do not want to take away the magic that made my own childhood more fun. Now I am torn in between. To tell the truth and take away the fun or to lie a little and risk my child distrusting me or worse, that my child imitate my little white lies int he future. The news of being pregnant is probably one of the most blissful moment that every expectant mother would have. Add up the good “build-up” from many other parenting blogs and pregnancy sites and you envision a perfect pregnancy and a happily ever after parenthood. But after you read out all those blissful blog post and you go back to real life, you begin to question. Where are those promising, fun, and happy moments that you have read? Parenting may not be perfect. It requires a lot of adjustment, tons of letting go as well as heaps of realizations. But at the end of the day, you begin to see what matters most in life-your children. Traditional School or Home School? Home Schooling is more individualized and structured according to the ability of your child to learn. Traditional school on the other hand is standardized, although teaching staffs are trying their best to teach and accommodate the concerns of every student, there are those that are left out. While home schooling is best for parents who stays at home with their kids, traditional school is much convenient for working parents. In the end, parents should consider what will work best for their children. The good thing is that there are two options that you can choose from if one does not work out. This is where most folks miss the point of the story. Now, how were the Apostles going to do that? God will give us whatever we need. When we need it. Jesus wants you to be another Apostle. You are not too old, too busy or unprepared. Just do it.